Think you're up on your Beatles trivia? Sure, you know A Hard Day's Night and 'The White Album.' But were you aware that The Beatles invented the 'thumbs up' gesture? 'Tis true. This and many more little-known facts have just come to light thanks to a video (see below) from the future called Beatles 3000 in which researchers 900 years from now piece together priceless bits of information about The Fab Four. 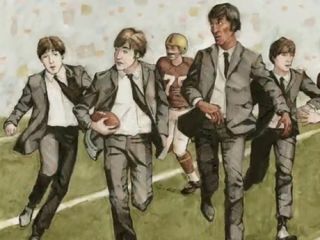 "There's a lot we don't know about The Beatles," says noted anthropologist Karl St Cloud IV, "but we do know that these four young men - John Lennon, Paul McKenzie, Greg Hutchinson and Scottie Pippen - were some of the finest musicians who ever existed." In the video, we come to learn that The Beatles traveled from their native home of Linverton to America to appear at "Ed Sullivan's annual Woodstock Festival." Dr Four Brixton, author of Unearthing The Lost Beatles Scrolls, marvels at the musicians' ability to write songs such as Ticket To Run and Wipe Out using "only the notes A through G - musical notation had not yet expanded to V."
Elsewhere in the clip, we're told that one of The Beatles' career highs came in 1965 when they won the Super Bowl at Shea Stadium. "It did quite a lot to raise the nation's spirits following the assassination of President Nixovelt," says Brixton. But perhaps The Beatles' greatest triumph, according to Stephens January, Ph.D, who cites other compositions such as Don't Stop Believing, Parents Just Don't Understand and Jimmy Crack Corn, was their groundbreaking album Sgt Pet Sounds And The Spiders From Aja. "Sadly, no copies remain," says January. However, his team of researchers were able to reconstruct the sheet music to one of the songs from the magnum opus, Layla In The Sky For The Benefit Of Shaft.